From the Land of Enchantment comes a beauty secret from long ago - Sacred Beauty Grains™ - an ancient botanical that archeologists recently discovered in an Anasazi Indian digging site. Buried for five hundred years, this nutrient rich "Anasazi" bean sprouted and can now be enjoyed once again. We share this secret with you in our Sacred Beauty Grains. Give your skin the kiss of Mother Earth, replenish lost nutrients, deep cleanse, refine pores, and diminish fine lines. Experience the radiant glow of a healthy complexion. From our mineral bath salts collections, each one of these richly scented aromatic baths offers a truly enchanting bathing experience. Ancient recipes are reawakened to enhance and balance our modern lifestyle. Choose from seven specially formulated blends of exotic oils and mineral salts to detoxify, relax and rejuvenate your body, mind and spirit. 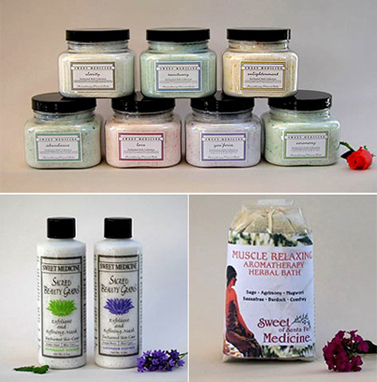 Used in a variety of beauty treatments, herbal bath teas tone, moisturize and hydrate. Now you can enjoy the ceremony of making your own bath teas with our special herbal bath recipes and the enclosed muslin bath bag. While enjoying a relaxing soak, scrub your body with the herb-filled bag to see a healthy glow and feel smoothness. The Rejuvenating bath herbs can be used as a body wrap or refreshing facial steam.